Mazda 6 Forums : Mazda 6 Forum / Mazda Atenza Forum > Mazda6 (Atenza) > Newbie Section > Long time car guy, first time M6 GTR owner. I hate to say it but that Model A hogs all of the attention and doesn't give your 6 anything for leftovers haha. The owner paints planes for Boeing. His home paint booth is professional as hell. Forgot to get a close-up of the laced visor. heavily silver flaked! Both cars look good. However I am partial to Soul Red. Such a gorgeous color! Did a quick detail on the 6 before a weekend road trip down the Pacific acoast Highway for a billiards tournament. 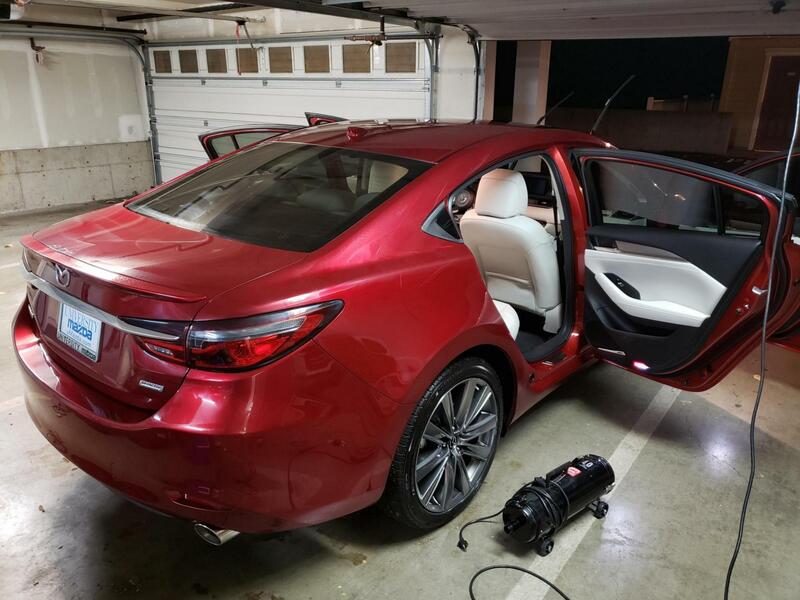 This is an in-process pic with the wax curing while I work on the interior. Sorry, pics didnt load the first time. Here is the 1930 Model A. Seeing that box sitting on the trunk lid makes me uneasy. Just a wedding present. No children or animals were in the box. Actually thinking more about the paint and scratches. OCD is me.